Robert C. Morgan. 50/50 (Learning to Swim), 1974. Performance at OK Harris, New York. Courtesy of the artists and Proyectos Monclova. Throughout his 50-year career Robert C. Morgan has been lauded as an author, lecturer, curator, and art historian. For decades he has maintained a rigorous studio practice in parallel to writing, showing his work in exhibitions at the Whitney Museum of American Art (1976), White Columns (1987), and the 49th Venice Biennale (1999) to name a few. Despite these lofty achievements, his acclaimed reputation as a writer preceded his other modes of production. At Proyectos Monclova, the exhibition Robert C. Morgan: Concept and Painting highlights Morgan’s vibrant artistic achievements through a survey of his dedicated studio output. Morgan is an undisputed authority on conceptual art, having written numerous books and countless articles on the subject. Yet in his studio he consciously sets aside predetermined methodologies that cast the artist as a researcher whose creative efforts require the support of an index of footnotes to be fully revealed. Instead he favors an approach to art-making that prioritizes the notion of what exists between concept and painting to inspire in the viewer an elucidatory moment of intrapersonal profundity. 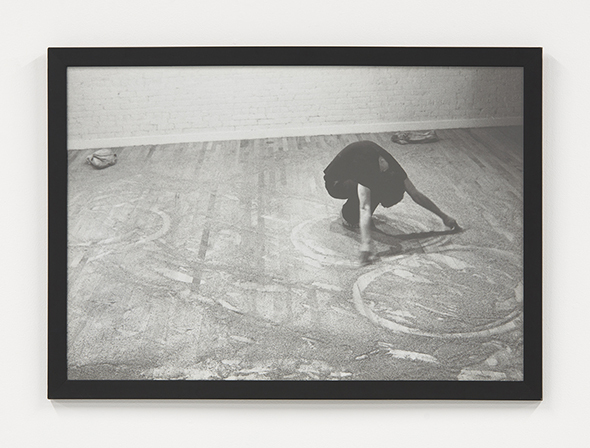 The pieces on view draw from a range of media—among them documentation from Morgan’s early body performances, calligraphy, drawing and collage. Despite the differences in media, these works all exemplify an approach to painting where the forms seem to vibrate in living stillness. In his hard-edge geometric abstraction Morgan tunes in to the longing for spirituality hidden by the feedback loop of distraction that characterizes the present day. Philosophical ruminations on presence, absence, space, gesture and organizational hierarchies take center stage in Morgan’s paintings and drawings, which operate with a strict focus. Their unwavering austerity demands that viewers confront and reexamine preconceived notions about what they assume contemporary art today to be (much less do). He highlights the values, priorities, and distractions that constitute post-internet space and social constructs by refusing to assume a reactionary position to them. Thus, he draws a parallel between space in painting and architectonic, psychological or even metaphorical space as construct rather than axiomatic. Taking root in both western and eastern traditions, including phenomenology and Taoism, the interplay between presence and absence, reflection and absorption, in Morgan’s work suggests that dualistic forces are complementary aspects of the same thing, unified rather than opposed. For example, though he is committed to a practice of abstraction, the body isn’t dismissed. There is a subtle intimacy to be found in the scale of his paintings and drawings, which is deliberately chosen to reflect the concept of the body in space; his performances from the early 1970s highlight and reflect the corporeal forces and movements that constitute his forms. While the early calligraphy pieces are predicated on gesture—as the form demands—the geometric series seek to paint the space of a gesture.